A large proportion of the people living in buildings close to Grenfell Tower show signs of post-traumatic stress disorder (PTSD), six months after the tragedy, which killed 71 people, the NHS says. Caused by very stressful or distressing events, PTSD can lead to nightmares and flashbacks, with sufferers often feeling isolated, irritable and guilty. So far, about 1,000 people have been screened for symptoms, with the number of PTSD sufferers at the highest end of a range of expectations after comparing it to other recent tragedies such as terror attacks. Overall, the NHS believes that as many as 11,000 people - including survivors, witnesses and the bereaved - could be suffering from the psychological impact of the fire, which took many hours to be brought under control. It anticipates that thousands of these people will need therapy. Who were the Grenfell victims? 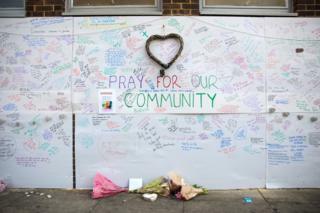 A special team of more than 50 therapists and 20 outreach workers has been established, called the Grenfell Health and Wellbeing Service, in what the NHS says is its largest ever mental health response to a traumatic event. More than 500 people have already attended sessions with NHS therapists to treat symptoms of anxiety and PTSD. So far, 150 children have completed or are having continuing therapy. "I'm not coping," one woman told an outreach worker. She lives in a flat in what is known as the walkways - right next to the burnt-out shell of Grenfell Tower, a potent and ever-present symbol of the fire. Her eyes filling with tears, she said she was having flashbacks and was struggling to sleep but had begun to get therapy, which was helping. "I thought I would cope, but I can't because the tower is still there. It's a big reminder, which you can't forget." The outreach work involves teams of NHS staff going door to door, working outwards from Grenfell Tower. They ask each person how they are feeling and look for signs of trauma. If appropriate, they complete an on-the-spot PTSD questionnaire. They call it "street-screening", and so far staff have screened about 1,000 people living close to the tower. The rates of PTSD picked up by the screening range from 75% of those screened in the buildings nearest the tower to 40% in buildings a little further away. But rates vary considerably from building to building. The plan is to continue street-screening outwards from the tower until the PTSD rate drops. But there are dozens of high-rise buildings, some miles away from Grenfell Tower, that had a clear line of sight to the burning building, and whose residents may also have been affected. The teams have also screened survivors from Grenfell Tower, most of whom are still living in hotels. I joined two outreach workers as they spoke to one survivor. "Feeling down, depressed, or helpless?" "I'm feeling down, not depressed, but down." "Is that every day, every other day, or for several days?" The man lived on the 13th floor, with his wife, son and daughter. The whole family survived. The other family members are getting counselling, but he felt he didn't need help. Six months on, he's now changed his mind. The family owned a leasehold flat in the tower, and he says the continuing process of seeking compensation from Kensington and Chelsea Council has made him feel increasingly anxious. "I tried to prove to myself that I can manage without [counselling], but I think it's the right time now to ask for help. "I've felt a bit sad, and I don't want to give up just because I'm not well. I have the feeling it's better to give up - that's the reason I'm going to accept some help." You can listen to Andrew Bomford's reports for World at One programme on the BBC Radio 4 website here and here. Kensington and Chelsea Council says it is doing all it can to ensure survivors and local residents have access to the mental health support they need. The outreach team is dealing with numerous logistical challenges, including incomplete lists of survivors living in temporary accommodation and frequently changing council key-workers who are meant to be the main point of contact with survivors. The team has even had to provide therapy to key-workers who have themselves become traumatised by their work. It's all been an unusual challenge for the NHS. "I think the outreach model is completely unique," said Emma Kennedy, from the Grenfell Health and Wellbeing Service. "Seeking out people, bringing them in, and walking through the journey of therapy with them, hasn't been tried in any other service in terms of disaster response." People who score highly enough under the street-screening tool for PTSD or anxiety are referred to therapists for counselling, often a course of cognitive behavioural therapy (CBT) or another talking therapy. Therapist Claire Gibson is treating a number of survivors. She said many had not been able to process their memories of what had happened on the night of the fire, because of the extreme stress they had been under as they had tried to escape the burning building. "The memory evolves like a multi-sensory video which can be re-triggered at any time." "People might start to get clips of what they saw, what they heard - even smelt, tasted, felt - on that night coming back to them in the months and years afterwards, and that can be very distressing." One Grenfell resident now experiences those feelings whenever he goes downstairs. "They actually smell smoke, and have the same fear they felt that night." Treating PTSD of this type involves a process known as reliving - having the patient talk through these experiences in minute detail in order to update the memory in a safe environment. I joined one patient, who asked to remain anonymous, during a CBT session. He witnessed the fire and lost three close family members in it. "When doing therapy, you're basically writing down what you've got in your head, but you're also re-writing what you've got in your head in a way that you're able to deal with," he said. "It most definitely put things into perspective for me, in terms of filtering the important thoughts and using them to move forward with my life." Many people living in the area say the constant physical presence of the gutted shell of the tower itself triggers flashbacks. Alastair Bailey, a consultant clinical psychologist who runs the adult part of the service, says it's a very difficult reminder for people. "There's been a lot of support in the local community, and that's a really helpful thing. "But there's another thing which is not so helpful in terms of developing trauma, and that's called rumination, which is going over what's happened to you again and again. Both things have occurred." The service expects to continue offering therapy for years to come, as PTSD can sometimes take years to develop. About £7m has been budgeted for the NHS health response this year, and up to £10m will be needed next year. The Grenfell Health and Wellbeing Service is a free and confidential NHS service for children and adults affected by the Grenfell Tower fire. You can access the service at The Curve, 4 Bard Road, W10 6TP between 10:00 and 20:00 every day. You can also call 0800 0234 650 (lines open 24/7), email cnw-tr.spa@nhs.net or if you are deaf or have a hearing impairment, you can use the Next Generation Text Service on 18001 0800 0234 650.